This is the first complete study of China's most popular eighteenth-century poet in any Western language. The work consists of a detailed biography, a study of Yuan's revolutionary reinterpretation of Chinese literary theory, and an analysis of his many contributions to the more original genres of Qing-dynasty (1644-1911) poetry such as narrative, historical, didactic, eccentric, and nature verse. The study is concluded by a generous and representative sampling of Yuan's poetry in translation, the first to do justice to the wide variety and richness of his oeuvre. Although many shorter poems are selected, this is the first translation to include his outstanding longer poetry. 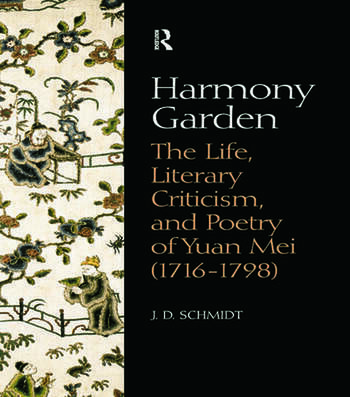 Harmony Garden will completely revise current attitudes in the west concerning classical Chines literature during the eighteenth century, a period that was long viewed as one of decline, but now appears to equal the golden ages of antiquity.